Installation view of Supra Muro. Photo: Ugo Carmeni. I have never seen an exhibition that was so perfectly matched to the space that hosted it. 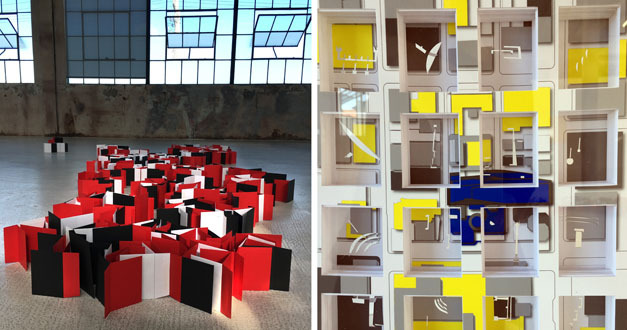 I am referring to Supra Muro, Marco Maggi’s show at the Hosfelt Gallery, a space whose large windows and skylights allow a flood of bright Indian summer sunshine to cascade into its maze of interconnected rooms. Maggi is a well-known artist who splits his time between Montevideo and New Paltz, New York, and who garnered international attention for his memorable show at the Uruguay Pavilion at the 2015 Venice Biennial. A video of that event, screened at this gallery in 2017, showed viewers staring intently at what appeared to be blank walls. objects should be seen as “works of art.” In many cases, the works are made out of white or softly colored paper that, when camouflaged against the gallery’s white walls, look a bit like Lilliputian origami. In other cases, the works are positioned far above or below the viewer’s eye level, re-scripting the way that we encounter them. In other words, these are works that ask us to discover them more than merely see them, recasting the viewer’s role into one of a forensic detective, hunting down ephemeral clues to an elusive and idiosyncratic artistic story. There are 33 works in Maggi’s exhibition (all dated 2018), and they can be broken down into about 10 different groups, which means that a description only a fraction of them can contained in the space of this review. Corner Syllable seems, at first glance, to be a cantilevered paint chip affixed to two intersecting walls. 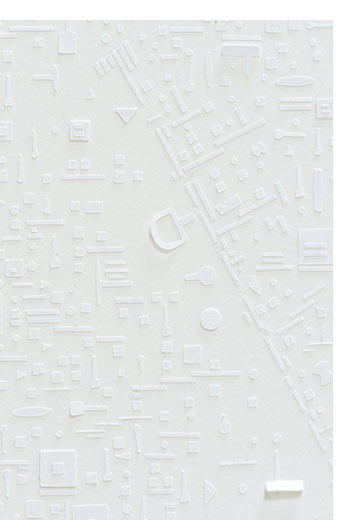 Closer inspection shows that it is in fact a complex collage made from several precisely cut shapes of white paper, suggesting a snowflake made by a poorly programed computer or, more accurately, an Exacto knife savant. 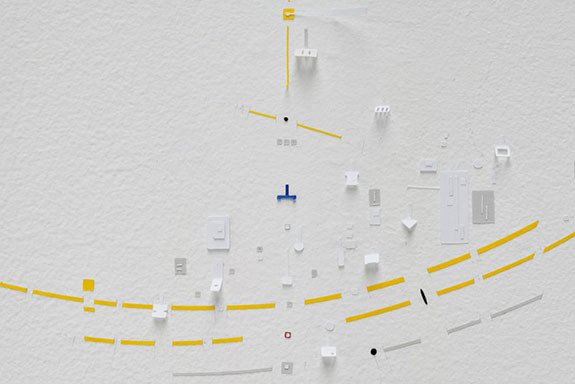 In a nearby work, Sentence, we see a sequence of these cut paper configurations, while in another, Floor Syllable, yellow paper spread out on the gallery’s floor does pretty much the same thing. 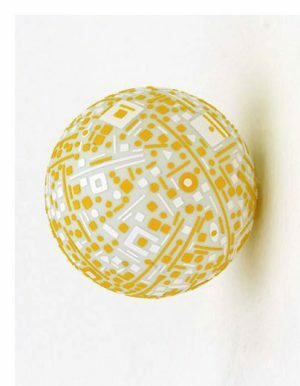 Wall, a ping pong ball covered with precisely cut configurations of bright yellow paper, effects the look of a complex computer chip affixed to a rounded surface. 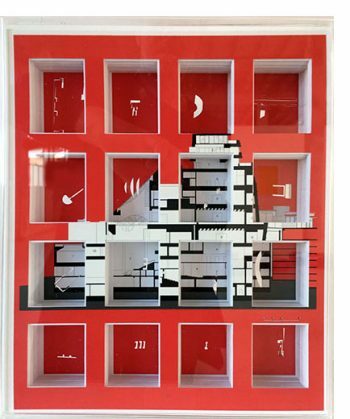 Framing Thesis, another collage-covered ping pong ball in a white box frame accompanied by a flat collage, exhibits similar characteristics. Lygia Pape, but his project also displays interesting kinships to the work Yves Klein and his Liberacian doppelganger, James Lee Byers. The influence of other North American artists such as Richard Artschwager and Donald Lipksi can also be detected. In the case of the former, it’s worth remembering the three-dimensional punctuation marks that were randomly dispersed throughout Artschwager’s exhibitions of the early 1970s, suggesting that the apparently physical interaction between art and viewer was in fact a linguistic transaction, while Lipski’s early Gathering Dust works from the early 1980s also opened the poetic possibilities of tiny scale. Maggi adds the elements of light and reflectivity to these mixtures, which makes his creations look a bit like a nano-technological orchid farm. There is nothing menacing to see here, just a delightful peek at the post-human future where no clouds of history can be seen to darken the view. Marco Maggi: “Supra Mundi” @ Hosfelt Gallery through October 6, 2018.